200 years of Freemasonry in Antwerp. Doesn’t that title sound a bit presumptuous? As long as our memory goes, we can remember 10, 20, even 30 or 40 years of the Craft, the way we have done it, the way it has been performed in this building, at this location. Of course some of us will remember the 50th anniversary of Lodge Wellington in 1984, with the visit of the Grand Master Mason and his officers. It was also the time of the rededication of the Lodge, an ancient custom in the Grand Lodge of Scotland when a Lodge has reached that age.. There is clearly a certain Egyptian influence to be perceived. Probably this was fashionable some 100 years ago. And that reminds me of the story that an elderly Mason told me once. There are two buildings in the Egyptian style in Antwerp, one in the Zoo and one in the Van Maerlantstraat. But only one is used by elephants. That takes us back to the so-called French period of Napoleon, doesn’t it? Yes, but Freemasonry was already present in our countries then. And, believe it or not, the oldest Lodge around here is the one at Lillo called ‘de Eendraght’ and constituted in 1764. But Lillo was Dutch territory at that time and that was not considered to be Antwerp. That town was a part of the Austrian Lowlands and Empress Maria-Theresa ruled over it, later succeeded by the Emperor Joseph the Second. Freemasonry was fashionable, especially in certain classes of society, such as the aristocracy, eventually also in the rich ‘bourgeoisie’. In 1776 the first Antwerp Lodge was constituted under the name ‘La Concorde Universelle’ with only members from the old families of Antwerp, such as Van de Werve, Werbrouck, d’Outrement,Van Ertborn, Knyff. In 1784 a second Lodge was created, with the name ‘La Parfaite Union’. Members were lawyers, traders, a chemist and even a butcher. But were these Masons all ‘Belgians’ or, let us say, all born in this town or country? This is not easy to find out. Nationality is something different in this period. Most of the time their origin is stated. Some were related to French or German families. They were born in Antwerp, but spent a lot of their time abroad, for all kinds of activities. Some of them even participated in Masonic work and the building of Lodges in, for example, Trieste (which was Austrian at that time), in Bremen or in Stockholm. The conquest by the French armies and the rule of the French Republic changed that comfortable world. The Bourgeoisie was ruling now and most Aristocrats, if they had not lost their heads, had escaped, far away, to Germany or to England. And the new religion for the emerging class of people was called ‘Trade’. In 1804 a new Lodge was created with the flamboyant name of ‘Les Amis du Commerce’. Shortly after that in 1808 a new Lodge was started, with a name that still sounds familiar to us: ‘Les Elèves de Thémis’. For those of us who still know their Greek Mythology, this was the obvious name for members from the Law professions. But dark clouds were appearing over the French Empire. At the battles in Spain they experienced the military power of a certain Wellington. They were to meet again. Soon. The Russian campaign brought more misery and the British were preparing to invade Antwerp. In the turmoil the Lodges of Antwerp were under real stress and they would either disappear, as was the case with ‘Thémis’, or cease their activities, as with ‘Les Amis du Commerce’. In 1815 the Low Countries were re-united and, were again, since a long period of time, ruled by a king, King William I of Orange and related to the English Royal Family. Since 1648 the river Scheldt had been closed most of the time and trade had been difficult. The opening of the river under this new rule made a lot of the people ‘Orangists’, but I don’t know whether the slogan ‘no surrender’ was ever used in Antwerp. However, soon there was a brand new Lodge called ‘Les Amis Sincères du Roi et de la Patrie’ or ‘The Real Friends of the King and Country’. It was a place where tradesmen and military people met. The commander of the fortified town of Antwerp, General Chassé, was Master of Honour. Dutch and Belgian people mixed without any problems. But also the Lodge ‘Les Amis du Commerce’ started a new life. Soon it would become a meeting place for Orangists and for people devoted to modern ideas. What ritual did they use? 1830 brought us the so-called Belgian Revolution and the fight for independence from The Hague. At the moment when revolutionaries came from Brussels to Antwerp, the citadel – still in Dutch hands – started bombing the town. Fire, panic and death spread all over Antwerp. A cease-fire was organised and even today historians are puzzled on what ground it happened. We do know that the leader of the Belgians was Bro. Frans Van Herreweghe from ‘Commerce’ and that he had talks with Bro. Chassé from ‘Les Vrais Amis’. Also present at the meeting was Bro. Verdussen from the same Lodge. And so we have come to the Belgian period, a little bit closer to our own time. What do we see then? Yes, of course, a name like ‘Les Vrais Amis..’ is difficult. There was a new King indeed, even a Mason, it is said... It was time for a new and better name, clearly reflecting both the past and the future. The Lodge changed its name into ‘La Persévérance’ in 1832. In 1850 they merged with the Lodge ‘Les Amis du Commerce’ and renamed themselves ‘R.L. Les Amis du Commerce et La Persévérance Réunis’. A Lodge, by the way, that still exists and that has its meetings in the ‘Huidevettersstraat’ in Antwerp. Soon after merging they moved to a new location in Antwerp, Meistraat, where they built a prestigiuos temple that was sadly demolished in the Sixties. We still have a lot of photographs of those premises and a booklet was published with moving pictures. What happened in this time with our ‘Thémis’? Well, it ceased all activities until 1850. And then, like a phoenix, it rose from its ashes. From 1830 on, the Roman Catholic Church had been trying to regain the power it had lost in the past period. A return to the Popish rule, as it had been under the Austrians, even under the Spaniards, was their greatest wish. And they worked on this, with important allies in diplomacy and in wealthy families. Step by step society was becoming more clerical. against: ‘The way of our Mother the Holy Roman Catholic Church with the Holy Father, the Bishops etc. who, for ages, have brought the only way to follow’. And, of course, in the Lodges there was no room for politics and religion. But ‘the enemy’ was at the gates. Moreover, let us not forget that the RC Church has always condemned the Craft in all its aspects. So, some Brethren decided it was their duty to go ‘in politics’ and that the Lodge had to take its responsibility in social and political affairs. Others still believed in the ‘Anderson’ way: that Lodges are a meeting place for people of different opinions and offer a moment of quietness and reflection in the turmoil of society. The first group joined ‘en bloc’ the ‘Persévérance’, which had united with the ancient ‘Amis’. The second group re-started the just-as-ancient Lodge ‘Les Elèves de Thémis’. A split had occurred in the Craft. It would not be the last one. Then came 1863, a glorious year for Antwerp and, indirectly, for Masonry in Antwerp. In that year the Belgian State bought from its former partners the right to have free navigation on the Scheldt. From then on all boats from the entire world could reach the port. It was the beginning of a great story of expansion that would make Antwerp one of the largest ports of the world. That expansion brought lots of foreign people to the town. Some of them were already Masons, others wanting to join the Craft. The problem was that until that time all meetings had been conducted only in French. Yes, it is an international language, and was so even then, but still difficult for Russians, South Africans or Scandinavians. Within ten years ‘Thémis’ started using Dutch during the ritual. How did they manage that? Well, they started a ‘section flamande’, a Dutch department in their Lodge. Dutch? But that was still Double-Dutch for some. So, very soon, around 1876, another new section ‘la section anglaise’ was started. Just like the Dutch section they were not to have a Worshipful Master, just a Depute Master. Yearly they would present their list to ‘Thémis’ for acceptance. Sadly enough a lot of the archives of ‘Thémis’ disappeared during the war. What we do still have is a reporting selection of the Minutes of 1886-1888. In this we find lists of Office Bearers, Audits of the Almoner, Applications for Master Certificates and Demands for Relief from Brethren mostly from Lodges abroad and stranded in Antwerp. From 1889 on we have the complete register of Minutes. It is actually on display in our window in the bar room of this building. Texts are very general, but sometimes they are sharp, whether on purpose or not. An example: one day the Secretary noted that the Depute Master was talking about tolerance and he adds to his text, tongue in cheek, ‘as usual’. At another moment, two visitors, apparently from the Flemish section, were arguing about what ‘real’ Masons should be or do. The Secretary placidly put in his Minutes ‘we couldn’t understand, then it was all in Flemish’. What it was about, we can guess now .. At that time a really important event was taking place in the Lodges. But let us return to the premises of the Lodges in Antwerp. The Lodge ‘Thémis’ had several locations through the 19th Century: Rijnpoortvest, St. Michielsstraat and, lastly, one in the Dokstraat in 1865, a street now called the Zeevaartstraat, not so far from the Waaslandtunnel. All the buildings have disappeared through the years. The last one, in the Dokstraat, was becoming too small for the three sections. A new, larger building was then considered. A trust was created with shares and apparently the ‘English’ Brethren were well-off, as 3/5th of the shares belonged to them. Ground was acquired in the ‘rue Van Maerlant’, a new area not so far from the Central Station. The first stone for a Temple, a Library and a Meeting place was laid on November 28, 1886. Almost one year later, on November 13, 1887 the Brethren took possession of the new building, the most modern Lodge in Antwerp and for sure in the whole of Belgium. We can still recognise some of the construction today: on the street side you had a blind wall with a small door. A corridor brought you through a small garden – now the bar – to the real building. Downstairs there was a large banqueting hall and on the first floor the Temple, as it is now. In later years a house was built between the street and the garden. You may notice that the staircase between the current library meeting place and the bar is typically an outdoor one. For some obscure reasons an argument arose among the Belgian members. Maybe this was a result of the high costs of the building, maybe on account of the repartition of the shares. We don’t know. Fact is that the ‘Flemish section’ constituted themselves in 1890 as a new Lodge called ‘Marnix van St. Aldegonde’. The other part of ‘Thémis’ left the building and moved to the Temple Meistraat, the one of ‘Amis du Commerce’. They were only to return after the First World War. The ‘English section’ – still having the largest number of shares – stayed, together with the new ‘Marnix’ Lodge. To make things easy, they decided to constitute themselves into an independent Lodge. In 1893 the Lodge ‘Anglo-Belge’ was born. Their colours were green and white and we still have their standard in our archives. To achieve this they had to apply to the effective Masonic ruler in this country, the Grand-Orient of Belgium. The GOB had lost its regular recognition in 1869 for reason of not respecting the Landmarks as being the VSL and the dedication of all the work to the Great Architect of the Universe. All this was a result of the heavy struggle between the Catholics and the Freethinkers in Belgium. Many of the latter belonged to the Craft and had an uneasy influence on the Lodges and later also on the Grand Orient. What do we know about that Lodge? Well, we have a lot of information about it. Its Rituals, lots of Summonses, the Accounts are all present in our archives, waiting for a zealous historian to put everything together and write a history of English-speaking Freemasonry in Antwerp. We have a picture of one of the Masters with his Office Bearers – also displayed in the bar room of this building. Some of the reports of the Committee of Enquiry have escaped the wars, too. We can learn from them that most of the members were of non-Belgian origin. Some came from the UK, others from Scandinavia, Russia, Mexico and South America. By the way a Committee of Enquiry was not so easy to arrange then eventually, 14 questions were put to the candidate. He had to bring with him at least three recommendations by Brethren and, important, had to present a written text on his daily occupations, say his profession. And then there was that notorious day in 1914… The First World War began, Belgium was invaded by the Germans. The French and British tried to fight back the enemy without success. Antwerp was occupied and the black-white and red standard was put on the cathedral. The Lodges ceased all activities, certainly one called ‘Anglo-Belge’. Ceased is not the correct word! Charity is not an empty phrase for the Brethren and they built up a real charity organisation called ‘het Antwerpsch Noenmaal’, which distributed free soup and other food to the poor and needy people of the town. A personal note: my great-grandfather, Antoine Delhez, was a very active member and I cherish a medal presented to his daughter Jeanne, who was also very active for the charity. By the way, there was already a German speaking Lodge in Antwerp before the war called ‘Hansa’. They met in the ‘Meistraat’ building, but were closed down in August 1914 for obvious reasons. They were never resuscitated/restored. After the end of the war Freemasonry returned to its familiar customs, its old buildings. Only it took some time to bring the British Brethren together in Antwerp. Some of them stayed in the army for a longer time. The Russian Brethren had disappeared in the turmoil of the Russian Revolution. 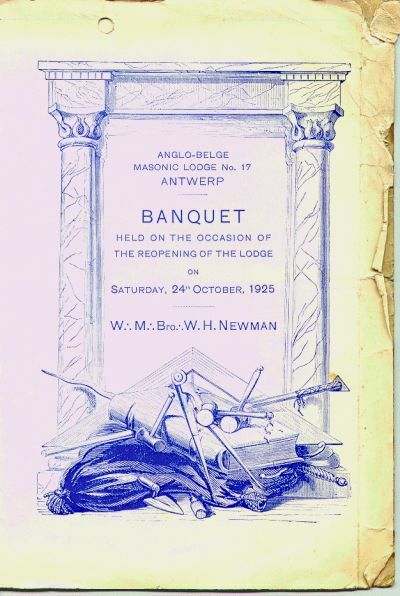 The ‘Anglo-Belge Masonic Lodge No 17’ started again on October 24, 1925 with a festive banquet. Worshipful Master was Bro. W.H. Newman, to whom the pillars of our Lodge Room are dedicated – see the inscription on their base. All good ancient people were present and W.J. Westcott, T.M. Brooks, Joseph Samuels, W. Humphreys and even William Hartley, a Past Master from ‘Marnix’ had been notified. Dual membership of Lodges was common, even at that time. But it was not all peace and harmony in the Lodge. Access to the Lodges of the UGLE was refused, even to long-standing Masons. On the other hand, strangely enough, the members of the Chapter Rose-Croix were considered as being regular and then there was that absolute anomaly of finding that the Grand Master of the GOB, Bro. Goblet d’Alviela, was a member of the Quatuor Coronati Lodge of Research in London. The visit of a delegation of ‘Anglo-Belge’ to London had no results. Grand Lodge told them that recognition was only given to Grand Lodges, not to single Lodges! So, my Brethren, it is simple: just ask the GOB to work in accordance with the ‘Aims and Regulations of the Craft’ and everything will be all right. There is another body that does accept single Lodges on their board. You may have guessed it already: it is the ‘Grand Lodge of Scotland’. They only ask one question: ‘How many Scots are members of your Lodge?’ You say ‘two’! The glorious dawn for ‘Lodge Wellington’ has then arrived. Bro. Newman wrote letters to all the members to explain the problem and to put forward the possible solution. In our archives we have the letter and the answers of many of the Brethren. Most of them are willing to accept the new rule, the new name. Some are very upset and use words such as ‘treason’ and even worse. The history of ‘Wellington’ is another chapter in the history of Freemasonry in Antwerp and it is not immediately the object of this lecture. I hope to bring it later, certainly with the help of other Brethren who have preceded me. To finish in beauty, as one said, let me present an event that spans the 200 years of Freemasonry in Antwerp. It all started, you may remember, with the ‘Eendraght’ in Lillo. Well, on December 20, 1763 a certain David Hume, a Gordon Highlander, was initiated there. He was the 9th member of the Lodge. By all means the first Scottish Freemason in Antwerp. On November 20, 2001 Bruce Malcolmson was initiated into Lodge ‘Wellington’. Yes, he is an American, but of full Scottish “Skye” origin. So, even after 238 years Scottish people are becoming Freemasons on the borders of the river Scheldt. Isn’t that wonderful and very reassuring for the future? I thank you all for the patience you have shown by listening attentively to my lecture. Long live this Lodge, the real daughter of 200 years of Freemasonry in Antwerp.